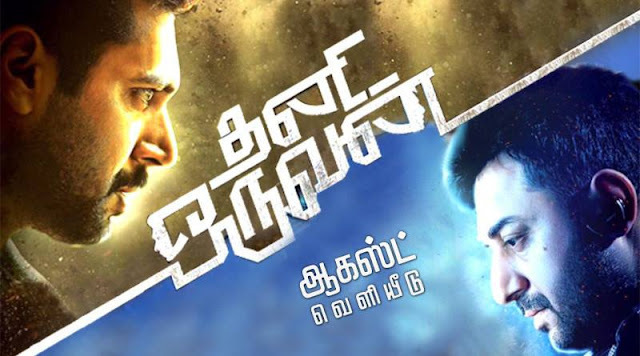 Mohan Raja’s Thani Oruvan is an interesting and intriguing tale between an upright police officer and implacable miscreant, who spearheads most of the organized crimes in the country. Battle between the good and evil is a tried and tested formula in Indian cinema but what makes Thani Oruvan, an enjoyable watch is the arresting screenplay and comprehensible characterization. As a fifteen year old teen, Pazhani aka Siddharth Abhimanyu (Arvind Swamy) accepts committing a murder so that his innocent dad, Sengalvarayan(Thambi Ramaiah ) could become an MLA, which would pave way for the life he intended whereas our protagonist, Mithran IPS (Jayam Ravi) is meticulously following all the crimes to choose his suitable opponents and even sketches a plan to arrest all of them. Easily, Thani Oruvan is one of the best films from ‘Jayam’ brothers. The script is highly original and the packaging is absolutely perfect with zero nonsense in the name of unwanted commercial elements like ‘Kuthu’ songs and crass comedies. The director excellently sketched the characterizations of his protagonist and antagonist, both are equally powerful and hence the film arrests all our attention. Subha’s dialogues are razor sharp, especially the lines like “Your choice of friend will show your character, your choice of enemy will show your capacity” and the scene where Arvind Swamy says “Love at first sight… Kill at first betrayal” are clap worthy moments. Another interesting aspect of Thani Oruvan is that Nayanthara, the female lead is not merely used as a glam doll, she is having a great scope in the movie and the actress too has portrayed it sensibly. To point out, the textual romantic conversation between Ravi and Nayan as Arvind Swamy has bugged the former is absolutely endearing. Also, the conversations between Arvind Swamy and Thambi Ramiah are hilarious, there are many such winsome moments in the film and it shows the effort the director has put in penning the script, kudos! Performance wise, Jayam Ravi is sincere that his tall masculine physique has suited the honest IPS officer role. The actor has improved a lot with his dialogue delivery that whatever he says in the film is convincing, way to go! But Arvind Swamy is the show stealer, with his chilled out attitude and swag mannerisms, the actor takes the film to a different level, easily one of the well sketched and portrayed baddie role in Tamil cinema. The rest of the actors including Thambi Ramaiah, Nassar and Ganesh Venkatraman have also done commendable job. Technically, Ramji’s cinematography is picture perfect while Aadhi’s background score is top notch. Overall, Thani Oruvan is a fairly engaging commercial cinema which should not be missed.